antique wines (GB) Your browser does not support any audio element. Already before 6,000 if not 8,000 years ago vines first cultivated and produced wine, prove in grape seeds found in Asia Minor (Anatolia in today's Turkey), remains of wine presses as well as numerous ancient ones wine vessels and wine motifs on artifacts from many areas. It goes without saying, of course, where the first wine was drunk. Chance has probably played a major role in the genesis. The cradle of wine culture Transcaucasia (Parts of Armenia. Azerbaijan and Georgia ), where the oldest archaeological finds were made, as well as the advanced civilizations in Mesopotamia (mostly today Iraq, as well as parts of Syria and the Turkey ), in the river basin of the upper Nile ( Egypt ) and in the Jordan Valley ( Israel and Jordan ). According to report in the Bible Noah landed with his ark at the end of the flood Ararat and became a winegrower. 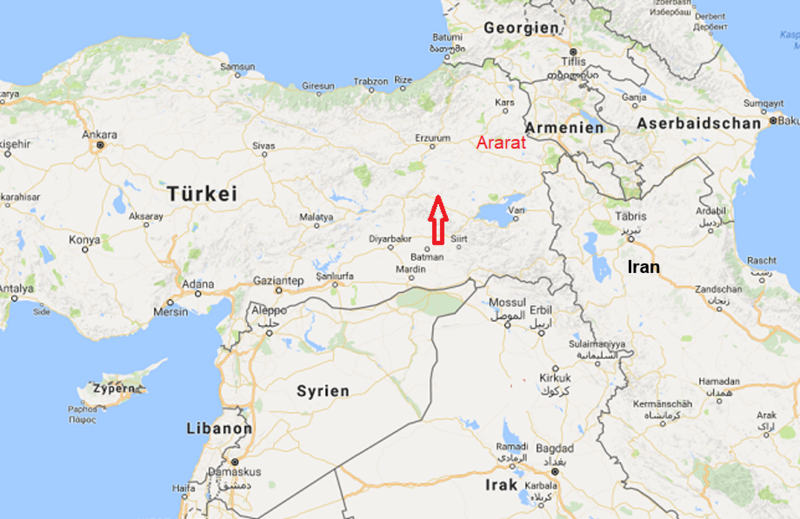 Incidentally, according to the latest research, the origin of the cultivated grapevine or the viticultural culture in southeast Anatolia should be (arrow). The ancient civilizations of the Assyrian. Egyptian. Babylonian and Persian have already been partially professionally involved in viticulture. Many passages in the Bible and numerous writings and murals of many ancient civilizations from these dominions report about it. Many of their knowledge, techniques and grape varieties would then be the first to be discovered in the history of ancient history throughout the Mediterranean Greeks and later Etruscans. Israelites. Celts (Gaul) Phoenicians and Romans. This painting comes from the tomb of Chaemwese in Thebes (Upper Egypt) around 1450 BC. There are among others the vintage fermenting in containers, as well as loading a ship with amphorae shown. The origin of European viticulture lies mainly in Greece. The poet Homer (8th century BC) tells of wine in his Iliad as a home drink of his epic heroes. Already in the Mycenaean culture in the 16th century BC Chr. (Mycenae = northeastern Peloponnese, Province Argolis) there was targeted viticulture. This is proved by archaeological finds in the old palaces, among other things one discovered cellars with leftovers in storage jars and grape seeds. The one on the island Lesbos born Greek philosopher Theophrastus (370-287 BC) already described the necessary vote of vine. soil type and climate, Usual Reberziehungs systems were the pulling of the vines on trees, the Bush form or the flat soil education. It was known that a corresponding pruning advantageous to earnings and wine quality. In addition to pure enjoyment, wine in ancient Greece also had an important religious and social role. Both symposia (Trinkgelagen) the sharing of wine among men gained a cult status and was an indispensable part of the former drinking culture, The health of the wine was equally important, it is often medical applications for the purpose of antisepsis, pain relief, digestive promotion or "to bring the juices of the body in balance" mentioned. In many medicines of the famous doctor Hippocrates (460-377 BC) Wine played a significant role. The best qualities came from the Aegean islands, These were above all Chios (Khios) - which is considered Bordeaux of ancient Greece - as well Rhodes. Samos and Lesbos, Furthermore, the wines from the peninsula Chalkidike ( Macedonia ) popular. For many of the then city-states viticulture was of great economic importance and wine was exported throughout the Mediterranean, but especially to Rome and Egypt. When the Greeks colonized the Mediterranean countries in the period from 1,000 to 600 BC, they brought along their winemaking techniques as well as their native grape varieties. As she crossed Sicily to Italy in today's two regions Calabria and Campania came, they gave the country the name Oinotria, In place of today's place Ciro (today's DOC) in Calabria was the city Krimisa Here, according to the legend, the wine was produced by the Olympic champions. The names of today's grapes such as Aglianico. Cesanese. Falanghina. Greco Bianco. Grechetto. Limnio and Malvasia suggest a possible Greek origin. Many of the Greek winegrowing methods were used by the Celts (Gauls) and Romans. However, there were also Roman developments, such as the addition of seawater or salt during the fermentation to make the wine smoother, to avoid a moldy taste or spoilage, and to improve the acidity lacking in the Mediterranean climate. These techniques were adopted by the Greeks. That from Theophrastus mentioned clogging of gypsum or marble dust was made for reasons of clarification and acidification of the wine. But there were also common methods, which today as wine adulteration would designate. Ashes were added to the wine with salt, spruce needles and various spices to reduce the astringency or to improve the taste. There were also techniques for turning red wine into white wine, which was achieved by adding bean flour or egg whites. The run juice was partially processed into special wines, but mostly mixed with the press wine. The fermentation took place in Dolium (Clay pot with several thousand liters of volume) sunk into the ground. Even during fermentation or shortly thereafter thickened must was added for sweetening and preserving. In general, the wine was on the lees leave and then often in the spring in amphorae tapped. The great period of ancient Roman wines dates back to the 1st century BC. By the end of the 2nd century AD, the three most famous wines in this period were Caecubum. Falernum and Surrentinum (White wines, Falerner also red), all - like most of the top Roman wines - from the region Campania came. But also the Haluntium from Syracuse (Sicily), the Pucinum from the Friuli ( favorite wine the wife of Augustus; 63. v. to 14 AD) and the Raeticum out Veneto are also worth mentioning. The biggest problem in the hot climate was the preservation and preservation of the wine, so that one had to deal with preservation at an early stage. Already Homer mentioned in the 8th century BC. The sulphurize and the flavoring of wine with spices and perfuming substances. They wrote the amphorae with pitch or pine resin and put on the wine surface a resin-oil layer. From this developed then the Greek Retsina, In ancient literature is often spoken of sweet wines. This was probably less due to the drying of dried grapes (though mentioned in Homer's Odyssey), but the fermentation, which usually took place at higher temperatures, got stuck. But intentionally unripe grapes were also pressed to produce wines with strong acidity. The largest market was Rome, where the free distribution of wine (not just bread) in the games of the patricians was plowed. Until the destruction by the Vesuvius eruption in 79 was the city Pompeii the main supplier. Wine was an everyday drink for all sections of the population, as evidenced by the saying "Vita vinum est" (wine is life). An excellent moral picture of the dining and drinking culture the Roman upper class forms the famous work Satyricon of Petronius, But there were big differences in quality. For the poorer classes and slaves it was iora popular, one Piquette from press residues. A popular non-alcoholic drink of Roman citizens and especially legionnaires was the Posca (a vinegar water). The best wines were mainly white wines. Aging, tannin-rich red wines did not exist yet. They were pale red and the everyday drink in the taverns. In the better layers was next to the mead the honey wine Mulsum very popular. The shelf life of the wines was very important for the Romans and they seem to have done more work than the Greeks. According to Roman law, a distinction was made between "new" and "old" wine, the second had to be stored for at least one year. In the case of white wines, the taste gradually changed from thick and sweet to light and dry. A widespread and fatal custom was to make grape juice in lead containers by cooking on a small fire defrutum to thicken the syrup. Chronic lead poisoning is mentioned in some sources as one of the reasons for the decline of the Roman Empire. If this is true, then (next to water pipes and cisterns off lead ) also contributed to this custom. 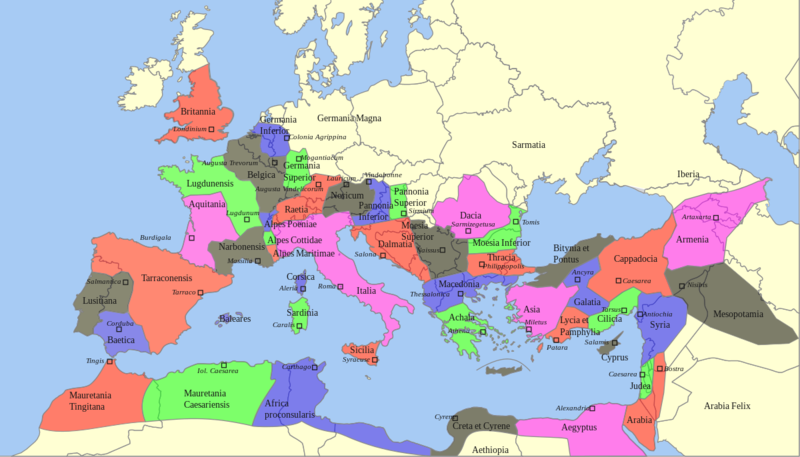 The map shows the Roman Empire at the time of the greatest expansion at the end of the reign of Emperor Hadrian (53-117). The Romans spread or cultivated viticulture in the expansion of their empire throughout Europe, Asia Minor and North Africa and influenced there by appropriate laws crucial to viticulture and wine culture. In this regard, especially the two emperors Domitian (51-96) and Probus (232-282), whose regulations and measures had a major impact on the viticulture of almost all countries in Europe. Many of today's names appearing to us German originate from the Romans. The most well-known are Wine from vinum, must from mustum (mustus = young, fresh), winepress of calcarium or cellar of cellarium. In many of today's traditional wine-growing areas in Europe, vineyards cultivated by the Romans were around the turn of the century. The documentation on wine and viticulture written by numerous Greek and Roman authors was in part valid until the late Middle Ages in the 15th century and the methods described therein were used. The Order of the Roman Catholic church later took the lead role of the Romans, consumed their experiences and perfected them. Special merits acquired thereby the Benedictine (from the 6th century), as well as the Carthusians and Cistercian (from the 11th century). This page was last modified at 18 February 2019 at 17:42.